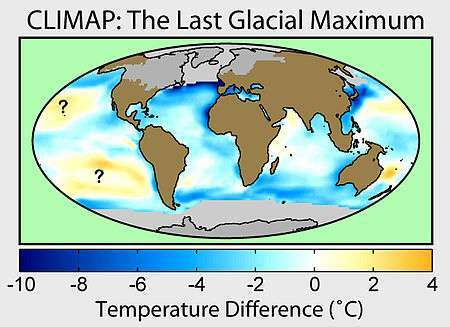 The Last Glacial Maximum (LGM) was the last period in the Earth's climate history during the last glacial period when ice sheets were at their greatest extension. Growth of the ice sheets reached their maximum positions in about 24,500 BCE. Deglaciation commenced in the Northern Hemisphere gradually between approximately 18,000 to 17,000 BCE and in Antarctica approximately 12,500 BCE, which is consistent with evidence that it was the primary source for an abrupt rise in the sea level in about 12,500 BCE. Vast ice sheets covered much of North America, northern Europe, and Asia. The ice sheets profoundly affected Earth's climate by causing drought, desertification, and a dramatic drop in sea levels. It was followed by the Late Glacial. During the Last Glacial Maximum, much of the world was cold, dry, and inhospitable, with frequent storms and a dust-laden atmosphere. The dustiness of the atmosphere is a prominent feature in ice cores; dust levels were as much as 20 to 25 times greater than now. This was probably due to a number of factors: reduced vegetation, stronger global winds, and less precipitation to clear dust from the atmosphere. The massive sheets of ice locked away water, lowering the sea level, exposing continental shelves, joining land masses together, and creating extensive coastal plains. Bathymetric data suggests there were two palaeo-basins in the Persian Gulf. The central basin may have approached an area of 20,000 km², comparable at its fullest extent to lakes such as Lake Malawi in Africa. Between 12,000 and 9000 years ago much of the Gulf floor would have remained exposed, only being flooded by the sea after 8,000 years ago. ↑ Clark, Peter U.; Dyke, Arthur S.; Shakun, Jeremy D.; Carlson, Anders E.; Clark, Jorie; Wohlfarth, Barbara; Mitrovica, Jerry X.; Hostetler, Steven W. & McCabe, A. Marshall (2009). 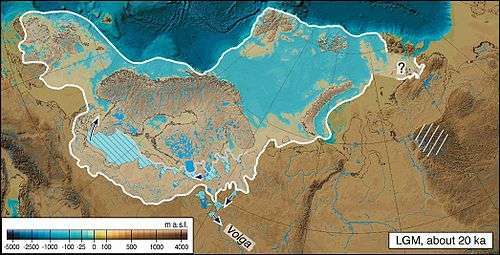 "The Last Glacial Maximum". Science. 325 (5941): 710–4. Bibcode:2009Sci...325..710C. doi:10.1126/science.1172873. PMID 19661421. ↑ Mithen, Steven (2004). After the Ice: a global human history, 20.000–5.000 BC. Cambridge MA: Harvard University Press. p. 3. ISBN 0-674-01570-3. 1 2 Mangerud, Jan; Jakobsson, Martin; Alexanderson, Helena; Astakhov, Valery; Clarke, Garry K.C; Henriksen, Mona; Hjort, Christian; Krinner, Gerhard; Lunkka, Juha-Pekka; Möller, Per; Murray, Andrew; Nikolskaya, Olga; Saarnisto, Matti; Svendsen, John Inge (2004). "Ice-dammed lakes and rerouting of the drainage of northern Eurasia during the Last Glaciation" (PDF). Quaternary Science Reviews. 23 (11–13): 1313–32. Bibcode:2004QSRv...23.1313M. doi:10.1016/j.quascirev.2003.12.009. ↑ Sathiamurthy, E.; Voris, H.K. (2006). "Pleistocene Sea Level Maps for the Sunda Shelf". Chicago IL: The Field Museum. ↑ Perego UA, Angerhofer N, Pala M, et al. (September 2010). "The initial peopling of the Americas: a growing number of founding mitochondrial genomes from Beringia". Genome Res. 20 (9): 1174–9. doi:10.1101/gr.109231.110. PMC 2928495 . PMID 20587512. ↑ "Mauna Kea Hawai`i's Tallest Volcano". USGS. ↑ Rabassa, Jorge; Coronato, Andrea; Bujalesky, Gustavo; Salemme, Mónica; Roig, Claudio; Meglioli, Andrés; Heusser, Calvin; Gordillo, Sandra; Roig, Fidel; Borromei, Ana; Quattrocchio, Mirta (June 2000). "Quaternary of Tierra del Fuego, Southernmost South America: an updated review". Quaternary International. 68–71: 217–240. Bibcode:2000QuInt..68..217R. doi:10.1016/S1040-6182(00)00046-X. Šibrava, V.; Bowen, D.Q; Richmond, G.M., eds. (1986). "Quaternary Glaciations in the Northern Hemisphere". Quaternary Science Reviews. 5: 1–514. Bibcode:1986QSRv....5....1S. doi:10.1016/0277-3791(86)90167-8. Adams, J.M. (1997). "Global land environments since the last interglacial". 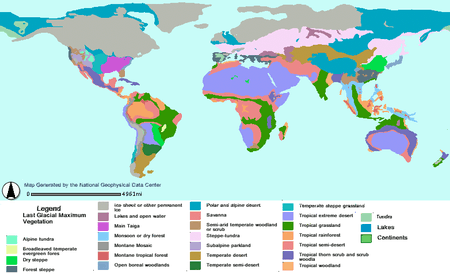 Atlas of Palaeovegetation: Preliminary land ecosystem maps of the world since the Last Glacial Maximum. Oak Ridge National Laboratory, TN.